Last week, Chilean Health Minister Emilio Santelices, appointed by President Piñera – who took office this year – rejected an attempt from company Gilead and a Big Pharma-related association of international drug makers in Chile to put down the resolution 399/2018 declaring public health justifications for the issuing of compulsory licences for sofosbuvir to treat a hepatitis C epidemic in Chile, that was issued by the previous government of Michele Bachelet. Among these efforts, Gilead lawyers presented a reconsideration request to the Ministry of Health arguing it did not meet legal grounds, particularly because it was taking into account the price of the drugs as part of the justification, and in their view that was not possible according their interpretation of TRIPS. 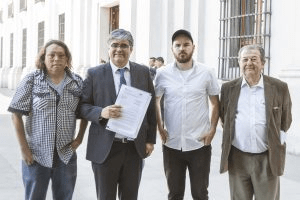 Innovarte, the Chilean NGO which started the process in Chile for the declaration of public health need at the Ministry of Health, and Giorgio Jackson, member of the Chilean Congress who has led the support for it from Congress, rebutted Gilead’s allegations. They raised the freedoms granted in World Trade Organization Agreement on Trade-Related Aspects of Intellectual Property Rights (TRIPS) as well as in the Doha Declaration on TRIPS and Public Health, and asked the ministry to upheld the declaration. Finally, the Minister of Health, Emilio Santelices, with Resolution 1165/2018 last week put an end to the controversy and rejected the Gilead and Pharma allegation, upholding the Resolution 399. This decision is particularly important not only from the humanitarian and legal point of view, but from a political point of view. It reflects the national consensus not only from the left parties but also from the right in Chile to put first the life and health of Chilean patients despite the lobbying and pressures to stop the use of legal right to declare a public health need for a compulsory licence. The current state of play in Chile also should be seen as a success for international collaboration among local and international civil society, as in this process Innovarte and other stakeholders have benefited from the expertise and support from Knowledge Ecology International and DNDi [Drugs for Neglected Diseases initiative], and other organisations including intergovernmental organisations, who in one form or another have provided support to overcome the lack of experience on this matter on local authorities. Gilead still might try to overturn the decision, taking the case to national courts, but is unlikely to succeed. Instead, what would be more logical on their side would be to offer the Ministry of Health a voluntary licence like the one offered in India and other countries to make such medicines affordable and avoid the fear of a precedent in the region. A copy of the resolution and other legal documents related to this process may be downloaded in Spanish in this link. Luis Villarroel is the Director of Corporacion INNOVARTE, leading the process for the compulsory license in Chile. "New Health Ministry Of Chile Reaffirms Path To Compulsory Licence For Hepatitis C Drugs" by Intellectual Property Watch is licensed under a Creative Commons Attribution-NonCommercial-ShareAlike 4.0 International License.